Bishop Edward B. Scharfenberger and more than 4,000 faithful from across the diocese gathered for the Diocese of Albany Eucharistic Congress on September 22, 2018 at the Auriesville Shrine. A “Eucharistic Congress” is a special gathering led by the bishop focused on our Lord Jesus in the Eucharist. The Congress was the first to be held since 1938 and included prayer, fellowship, adoration, music, reconciliation and a Eucharistic Procession. During the morning liturgy, deacons and priests of the Diocese of Albany recited a renewal of commitment and rededication. It was a powerful, and grace-filled, day at Auriesville. #HeartsAflame (Photos by Kate Costello). Read the issue in pdf or click on the image to the left. C21 Resources is a compilation of critical analyses and essays on key challenges facing the Catholic Church today. Each issue features original and reprinted articles around a particular theme. ​In Christian theology, the term Body of Christ has two main but separate meanings: it may refer to Jesus' words over the bread at the Last Supper that "This is my body" in Luke 22:19–20, or to the usage of the term by the Apostle Paul in 1 Corinthians 12:12–14 and Ephesians 4:1–16 to refer to the Christian Church. Click on the buttons below to learn more about these two meanings and the scriptural foundations for each. What Scripture Teaches us About the Eucharist. What Scripture Teaches Us About Being the Body of Christ. ​Every Sunday, Catholics gather together to attend Mass in memory of Jesus. At Mass we give God our thanksgiving, praise, and worship. We hear his Word and receive the Body and Blood of Christ. Participating at Mass is the most important thing Catholics do each week, for it is at Mass that we are changed, becoming what we have received in the Eucharist. The Mass charges us with an important mission—to be Christ in a world that is broken and in need of healing. 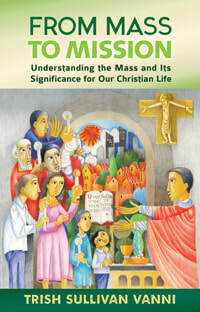 ​This five part series for adults, teens and children explores the parts of the Mass in a deeper way, helping you to better appreciate the meaning of the prayers, responses, acclamations, gestures, signs, and symbols. From Mass to Mission will inspire you to be more actively and consciously involved in the Mass and in the world as Christ’s disciples. Click the image at the right to go to our Programs Tab. BustedHalo.com's fantastic introduction to the Sacraments series. BustedHalo.com's introduction to the Sacraments series continues as Fr. Steven Bell, CSP, answers more questions about what Catholics believe about the Eucharist and receiving Communion: How does the bread and wine become the body and blood of Christ? Is Communion a reenactment of the last supper? Should you not receive Communion if you have sinned? Why can't non-Catholics receive Communion in the Church? These questions and more are answered in this edition of "Sacraments 201," a web video series geared for those who'd like an introduction or refresher course on these important, tangible Catholic experiences of God.